When fielded, you may draw and roll one die. If you roll a character side, that character deals damage equal to its attack to your opponent and goes to your used pile (otherwise, the die goes to your reserve pool). Characters with “Draw Dice” effects—such as Gambit Ace: Cardsharp—are triggered when the requirement of the card effect is met. In the case of Gambit, this is when this character is fielded. Since fielding Gambit would occur during the Main Step (which happens after the Roll and Reroll Step), dice rolled using Gambit’s effect cannot be rerolled. Magneto: Hellfire Club: While Magneto is active, if your opponent has no Villains in the field, he takes 2 damage each time he draws one or more dice from his bag. ^ Lantern Power Ring - Flight. Wizkids Rules Forum. Retrieved 8-7-2015. 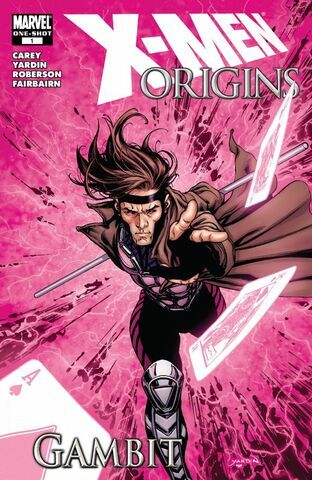 ^ X-Men Origins: Gambit Vol 1 1 Marvel Database wikia. Retrieved 8-7-2015.